Steven and Millie Tani are having a blast dressing up as their favorite pop culture characters. They say that the couple that cosplays together stays together. 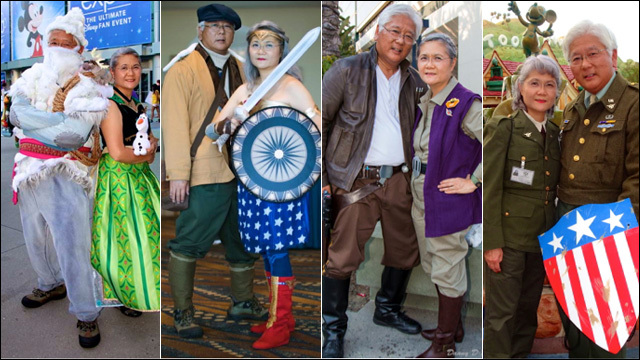 Meet Steven and Millie Tani, a retired couple that spends their leisure time getting dressed up as their favorite pop culture characters. The couple, who have been married for 27 years, caught the cosplaying bug three years ago when they needed costumes for Halloween event at Disneyland. They went as Carl and Ellie from Pixar's Up. Since then, the Southern California couple has suited up as everything from Captain America and Agent Carter to Han Solo and Princess Leia, traveling to events and conventions around the state. Their daughter, a veteran cosplayer herself, suggested they document their newfound hobby on social media. You can view fun photos of Steven and Millie's costume exploits on CosplayParents.